The week that was in the world of BIM and other Techie fun stuff, for the week of May 17th – May 23rd, 2015. We will start this weeks Roundup off with a neat little post from Revit OpEd about IFC in Revit 2016. Now for a little Bluebeam love from Carol over at Carol’s Construction Technology Blog. Here is a Revit tip about Snap, to keep you from Snapping from the Revit Kid. Keeping on the Tip Train here is a trip from What Revit Wants. Here are three neat posts about Revit (they could be part of the “Tip Train” too) from Cadline Blog. This is the first post in a new series by the ConAppGuru, but this time its double the bang for your buck with 10 not 5 workflows. Another post to do with Construction Apps, but this time from Extranet Evolution about the Plangrid app. Now lets bring some Dynamo to this part, with the 6th post in a series by Revit Beyond BIM. This next post from RVIT seems simple enough, but it can’t be over stressed even with all the technology we have today we still need to communicate (and do it well) to succeed. Have you ever wanted to do a slopped rail without a host, well the you need to check out this post from landarchBIM. The BIM 360 family has grown once again, Autodesk has released BIM 360 Plan. (In The Fold). 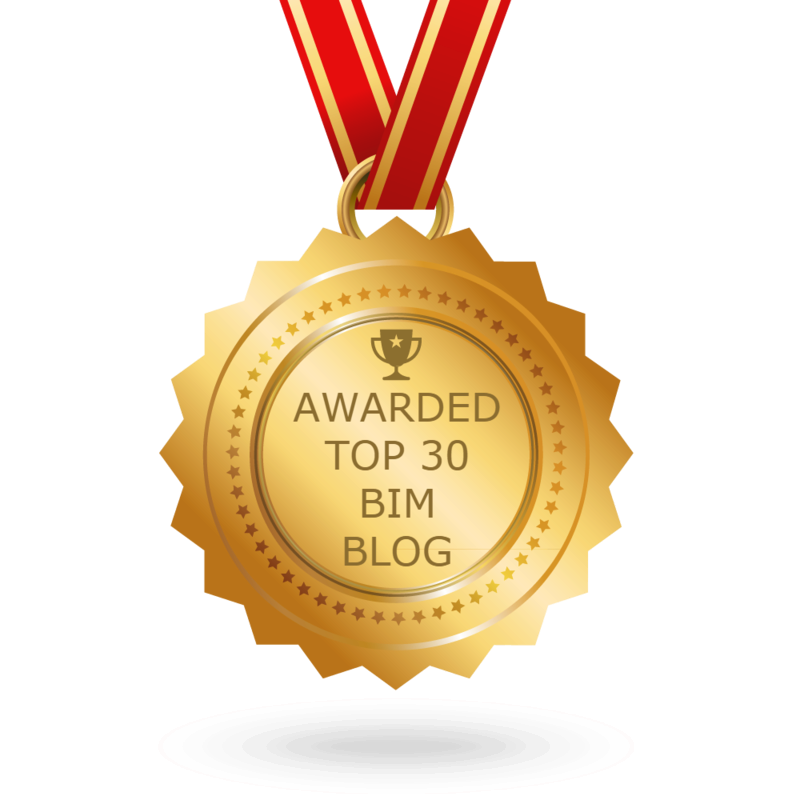 Here is more about BIM 360 Plan from Beyond Design. If you are going to be in Vancouver next week (May 27th & 28th) then you should check this event out. Learn more from the BIM Jedi. Now for some more easy to use Dynamo content from Marcello and Simply Complex. Because what would a Roundup be with out new Revit 2016 info……I know starting to get past the “New” phase(CadLearning Blog). Here is some more what’s new, but this time for the Navisworks 2016 family, also by the CadLearning Blog. Not to be left out, here is some info on the new Revit MEP 2016 feature of including fabrication parts (Cadline Blog). If you are thinking about moving to “Level 2” BIM then you should check out this article in AEC Magazine. Check out this weeks Podcast over at BIMThoughts. 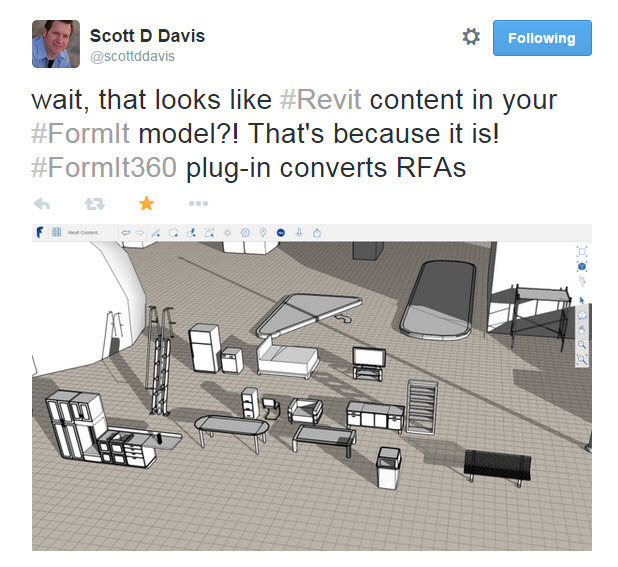 Here are a couple of Tweets from Scott Davis about the cool need Revit Add-in for FormIt 360 to allow to convert RFA’s and Sketchup Files to FormIt 360 content…….as well as begin able to convert FormIt 360 Content to RVT. 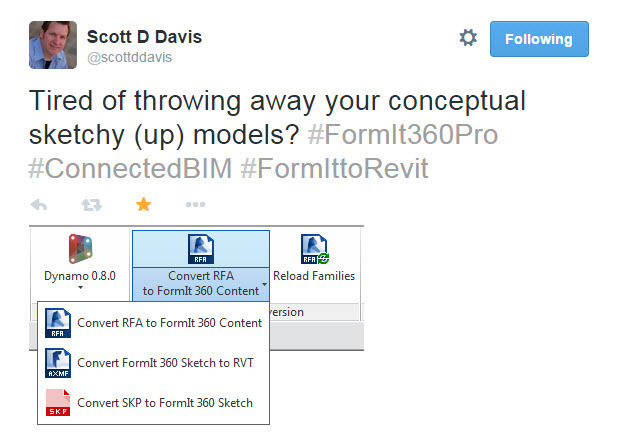 You can get the Add-in from the FormIt 360 site. Check out this week in Construction Blogs post from the ConAppGuru. Here are 4 posts from the RTC News Blog, One about the Father of RTC (Wesley Benn), One By him on how RTC AUS 2015 went, One about the progress of registration for RTC NA (sign up here if interested), and the last one about where all the people are coming form for RTC NA 2015. Keeping with the Roadmap theme, having a plan of attach for your project, and how you are going to share and collaborate on that project (and with the project data) is a good thing. Find out more in this post on the CASE blog. Here is a post about a “half baked” post on a Dynamo package from What Revit Wants. Luke at What Revit Wants also add this helpful post if you are looking for some info on Building Design and Construction with BIM. This is a cool post from Philip of Phil-osophy in BIM that he learned from Brian Mackey & the CAD-1 guys on Revit Radio. If you work in Revit MEP then this next post is pretty cool (it’s pretty cool even if you don’t work with MEP), post in AUGI. Here is the latest from Marcello and Simply Complex on Dynamo for the everyman (or everywoman). More fun with coding (or should I say Macros) from ArchSmarter……..and for the record I hate it when the city doesn’t like my font! FormIt Friday – Episode 3 – Live from AIA! This post is a little old (a week or so) but still kind of interesting, Autodesk has released all the files (made them open-source) for there 3D printer. Learn more at Between the lines. Wondering how Revit 2016 really performs? Well then check out this posts from Inside the Factory.